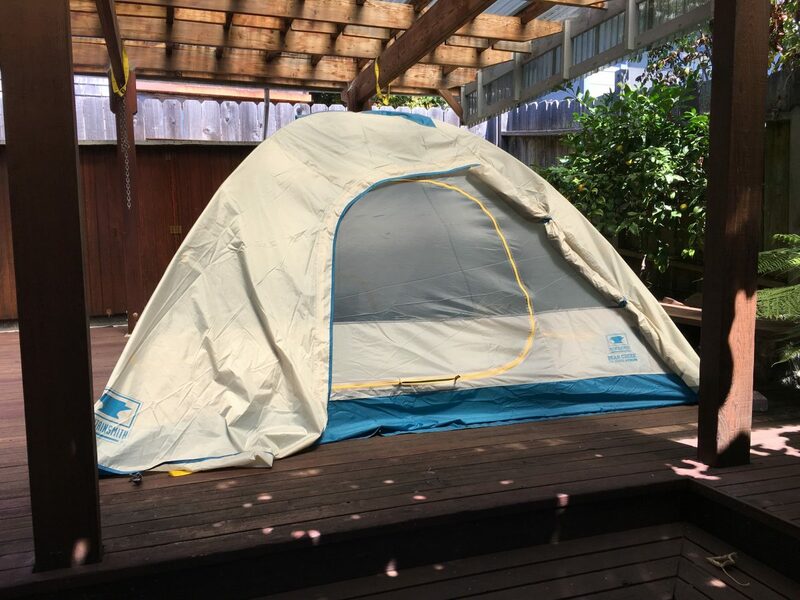 It’s day 32 of camping in a tent in my backyard. I’m sleeping in a tent on the back deck due to some home improvement projects. I don’t usually spend a lot of time in our backyard as our front deck is where we have a view. I’ve learned an awful lot about what goes on in the “rear of the house”. After the first night I quickly learned there is a small dog that consistently barks for about 15 minutes at 9:30pm. The neighbor kitty-corner to our house is an amazing whistler when he wakes up and goes to bed. The neighbors on the other side eat dinner and wash dishes quite late at night. Those are all pretty basic. What I didn’t expect was the animals. I live in a residential neighborhood but it has felt like the wilderness at times. The first night I was sitting out back with a blanket in my lap reading with a low light. All of the sudden an animal ran up my lap. I yelped as a baby skunk ran back to cover in the stone wall. Recently, a large raccoon decided he’d had enough of me on the deck, wanted his territory back, and spent about 45 minutes walking around the tent growling. He must be king of the deck because last night he got in a rumble with some other animals and one of them fell down the steps. And, kiwi fruit, they tend to drop from the arbor between 4-5am and feel really squishy when you step on them in the dark in barefeet. Lastly, the Golden Gate Bridge is really loud when there is no wind and a big fog at night and no walls or windows to break the sound. A lot goes on in the rear of our house that I never realized. It reminded me of a story of a client who decided to do an afternoon huddle with her team. She was checking in and asked “how did it go today go?” One of her staff members said, “today really sucked”. Why? she responded. The staff member responded.. “well, you set up the desk and file cabinet for the new employee in our space and you took our file cabinet away where we share snacks and treats. Now we don’t have any place to share cupcakes, birthday cakes, bagels, and fruit.” My client thought she was joking and laughed. She then realized she knew nothing about the treat table, she had stepped into their space and had not discussed the change. The table was a small thing to her but was super important to the team. She learned something about her team right in her own backyard and brought a new cart for treats the next day. It made me wonder, are there other cues we miss by not walking around and learning what goes on in the “backyard” of our offices and communities. What noises are we not hearing because we just are not there at the right time? What activity is going on that we are missing that if we knew more about we could help a team or family to have greater energy and joy? How do we create time to check in on the front and back of the house? Learning to manage by walking around seems to be something we miss under the demands of our schedules. There is even an acronym for this MBWA! Take a walk to your backyard this week, what do you learn? For me, I’ve stopped yelling “get out of here” at the raccoons. I’ve intruded on their space and I just have to let them rumble. I look forward to meeting the whistler some day. And as for the skunks, we have lots of yellow jackets this year which they like to eat so I guess I’ll just not sit near the rock wall any more. Most importantly, the house project should be finished soon.